Sophie is given an extraordinary book to repair, and with it comes all manner of magic and danger. If E. Nesbit penned Don Quixote, the results would be something like this extravagant tale. 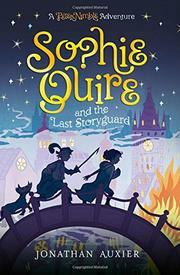 In this sequel to Peter Nimble and His Fantastic Eyes (2011), that book’s title character returns to meet his equal in Sophie, a 12-year-old bookmender. She has dark skin, unlike most of her fellow Bustleburghers, inherited from her deceased mother, who came from a faraway island. Peter delivers to her the magical Book of Who, which puts her in the sights of Inquisitor Prigg, whose life objective is to destroy all nonsense, most specifically storybooks. Sophie quickly learns that the danger to her is very real, as she is a Storyguard, like her mother before her. In the dubious company of charms-purveyor Madame Eldritch, a hexed mandrake, Sir Tode (a small, hooved, catlike creature), and a giant silver tigress, Sophie must find and protect the other three books: of what, where, and when, of course. Together, the four volumes contain information about all the magic that ever existed. Themes of parental legacy, friendship, and the permanence of stories in the minds of their readers are woven through this elaborate adventure. Auxier balances delectable language, invigorating nonsense, and wisdom with aplomb.